At Sitback, we have had the opportunity to work on a wealth of products and services across different brands and industries. 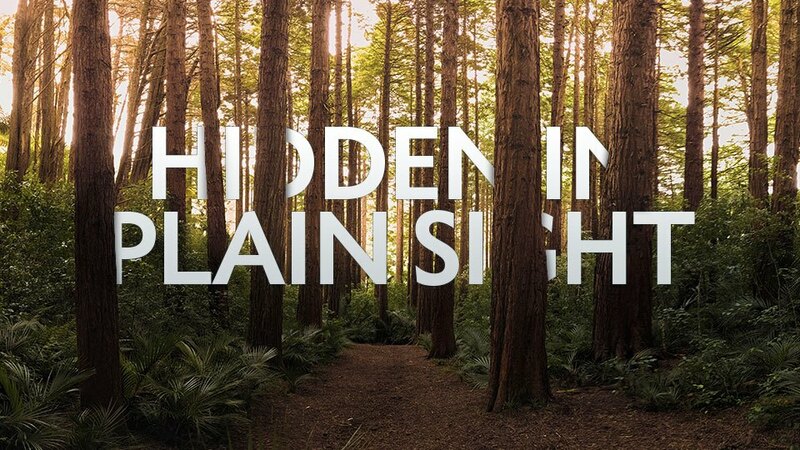 It’s perfect for us since we have an endless curiosity about how people think and do things and how we can design better experiences for them. During one of our recent projects for Anglicare, a group of people were brought to the centre of our attention and we thought the work was so interesting that we wanted to share some of our learnings with you. In fact, our initial findings have proven so popular - both within our team, and wider industries - that we decided to dig even deeper and commission our own Research Project into the subject. More details on that at the bottom of this post. 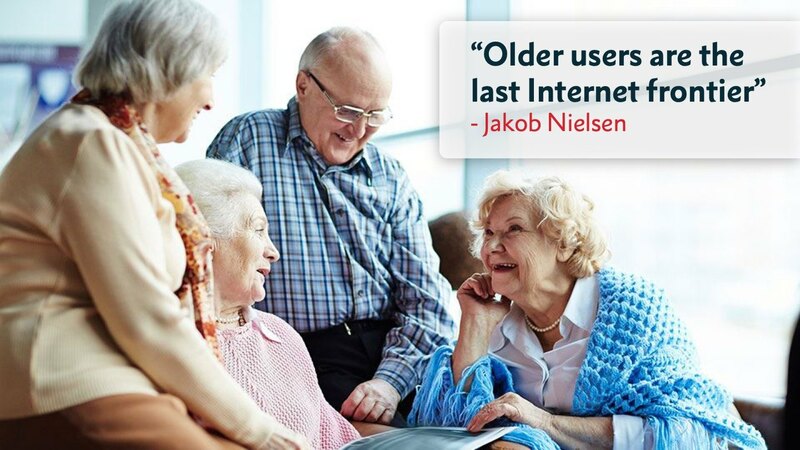 Today, we want to look at designing for what Jakob Nielson refers to as, ‘the last internet frontier’ - users over the age of 65. Anglicare offer a wide range of services from family support, to migrant and refugee assistance, and of course aged care and retirement living. When we first began working with Anglicare they were facing a number of challenges including: merging their aged care and retirement living arm of the business with their wider services; and preparing for changes in the Government Funding model. The latter of which meant that the choice of service provider for aged care services was going to sit with the actual person who receives the services, instead of the person providing the funding (i.e., the Government). Essentially, older adults who need some help around the home were now going to be able to choose their preferred supplier. This meant we spent a considerable amount of time gaining a deeper understanding of how the over 65’s interact online, gaining some insights into how we can better communicate and market to this group through these channels. Through this work we have learnt that not only is this age group actively online and making purchasing decisions, but there are some relatively easy ways we can ensure that we are not alienating but rather creating engaging online experiences for them. Of course, it makes sense for Anglicare to focus on this audience. They are, after all, the priority market for some of their core service offerings. But should Marketers and Experience Designers across other industries have more of a focus on the “grey dollar”? The answer to this is an emphatic, ‘yes’. In a world where we are always looking for ways to increase a market reach, it appears there has been an almost untapped market right under our noses. So why is this demographic important? Well firstly, there is an ever increasing proportion of people in it. 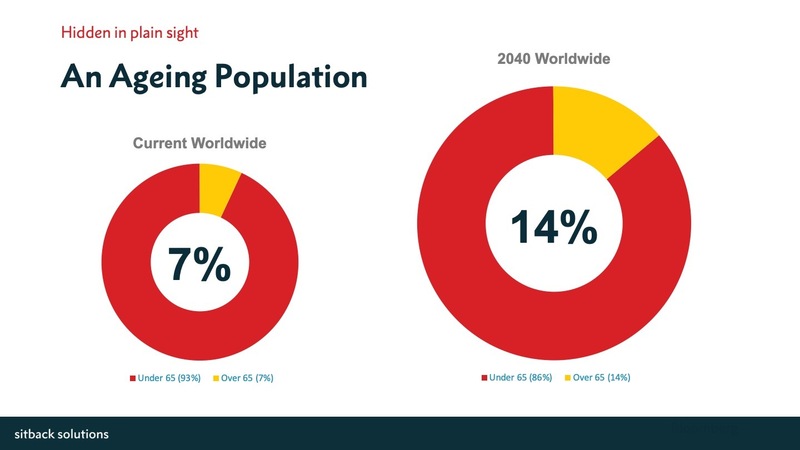 Bloomberg estimates that by 2040 the number of people over 65 will double globally from 7% of the population today to 14%. That’s an additional 700 million people! And what about Australia? In 2016, 3.7 million Australians were over 65. That’s 1 in 6 Australians! By 2020, this group will grow to around 16% of the whole population of Australia. This is a trend that is expected to accelerate with people living longer and Australia's fertility rate at a 10-year low. In fact, by 2056, it is estimated there will be 8.7 million. So why is this group so commonly overlooked? There are some common misconceptions… …let’s call them myths... …about people over 65 that can prevent businesses from seeing them as a valuable target market. Let’s dive into some of them now. There is an image of retirees having limited funds and having to budget just to get by. And while this is certainly true for some, as a group the picture is a bit different. People over 65 tend to have a healthy disposable income. According to Centrelink at the time of our research, 59% of older people receive a full rate pension – that’s $797 per fortnight for a single, or $1,203 per fortnight for a couple. According to the Australian Institute of Health and Welfare, 12% of those over 65 are still working. And that’s not to mention the $155k on average that a person aged 60 - 64 has in their super fund. Taking into consideration that this tends to be an asset-rich age group who are relatively debt free, it is clear to see that this is a demographic that shouldn’t be overlooked when it comes to spending power. 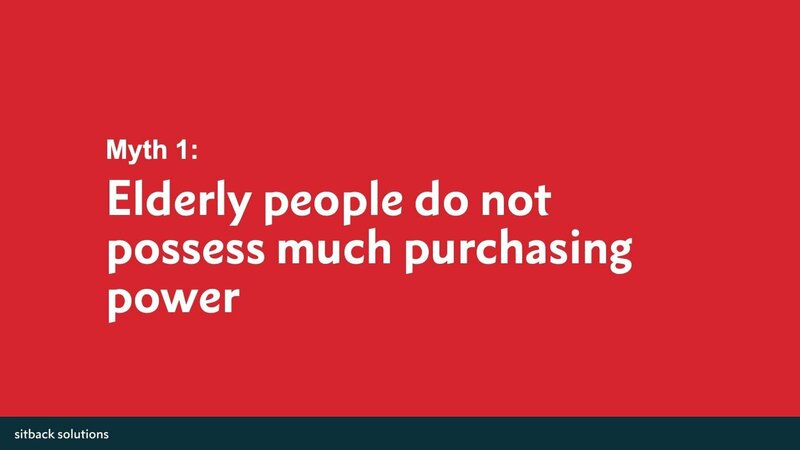 In fact, they are likely to have more spending power than the ever front-of-mind Gen Y and Gen Z! Once we accept that people over 65 have spending power a second protest often appears. There is often a misconception that elderly people are not interested in spending money on a lot of things that concern the younger generation, when in fact, this demographic today is actually keen to keep up with the younger generation. In much the same way, they are after cars, clothes and home renovations; have an interest in travelling, health and fitness, eating out and going to movies. Not to mention, they are spending on mobile phones, computers and other technological products. Senior group members like to get out and about for things like entertainment (e.g., going to the movies). They enjoyed online games and betting. Seniors had a keen interest in shopping and looking for good deals. Travelling was a real interest for members. According to a study by Macquarie Radio Network, 30% of total travel expenditure comes from people aged 55 – 69. People in this age group are also making purchasing decisions for other generations. For example, about 19% do grocery shopping for their family members. 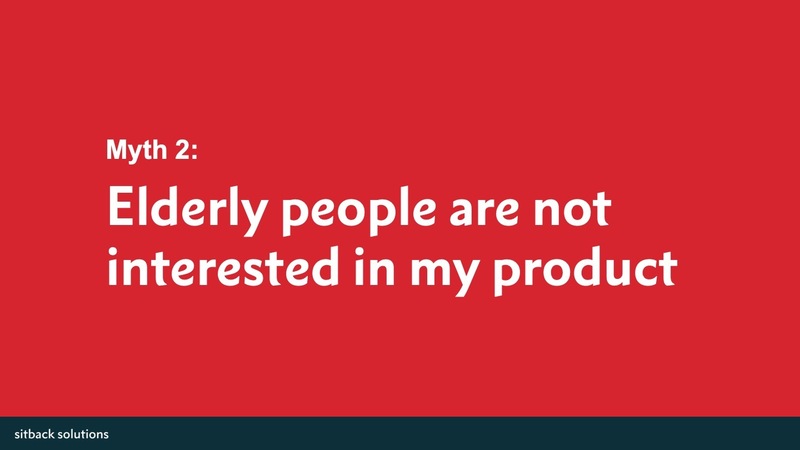 Okay, so people over 65 do have the spending power and are interested in buying your products, but does that mean we should consider them in our online channels? This leads me to myth number 3. According to a 2012 study by AIMIA, people aged over 65 spent more than three hours per day browsing the internet and were responsible for 20% of Australia’s total internet traffic. 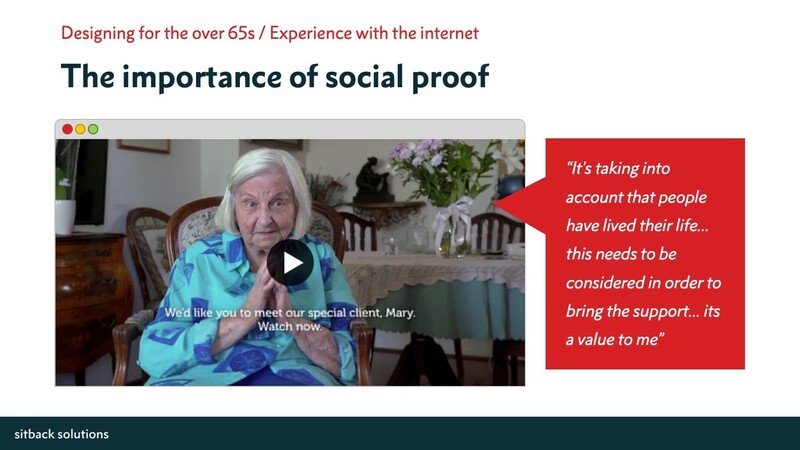 Indeed, in our work with Anglicare, we found that people over 65 were spending approximately four hours per day on the internet. 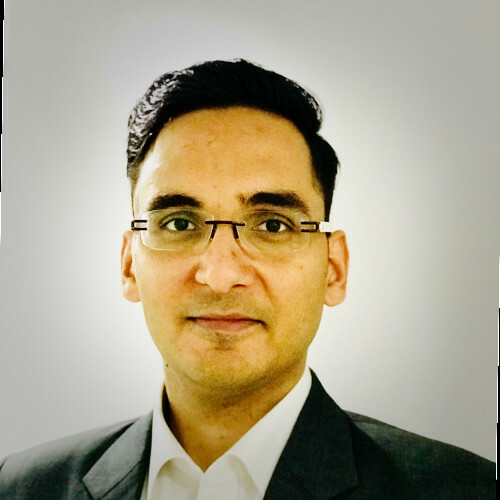 Not only that, they were likely to begin their search for home care or retirement living options online and create a shortlist of providers they were interested in before calling them. So although they may not yet be making as many purchases online, they are certainly using the platform to inform their purchase decisions. The over 65’s are using other digital channels as well. 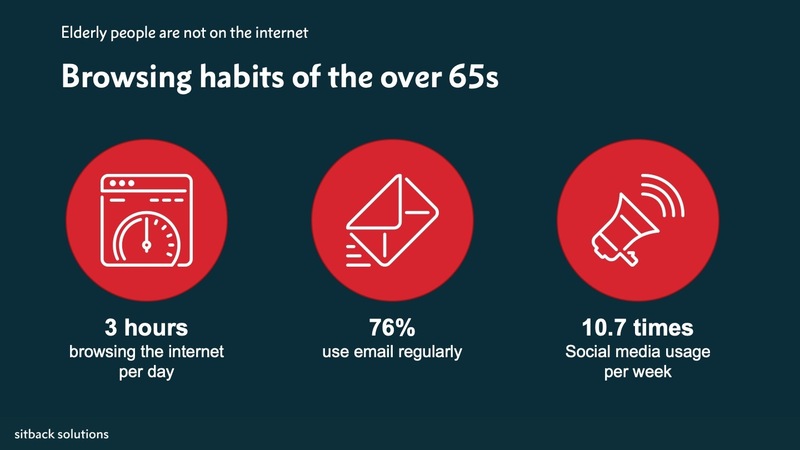 According to ACMA (Australian Communication and Media Authority), 76% of older Australians use email regularly. Also, more than half of the 65+ population use social media networks like Facebook, Twitter and LinkedIn. There are over 3 million Facebook accounts in Australia that belong to people 65 and over - and they are using them. On average, 10.7 times per week. So social media marketing should be an easy way to reach these people! When we look at what they are browsing for we can see it is a wide variety of things, including. Finance (e.g. online banking, pension accounts). Hobbies (including finding shows or cinema times, restaurants). Social (e.g. reconnecting with people from previous jobs or times in their life). Shopping (Increasingly this age group are shopping online whether that be browsing to make a shortlist or actually making the purchase). So now we can see that there are many reasons for having more of a focus on this demographic in our online marketing and communications. From our work with Anglicare, we learnt some important lessons when it comes to targeting this group. 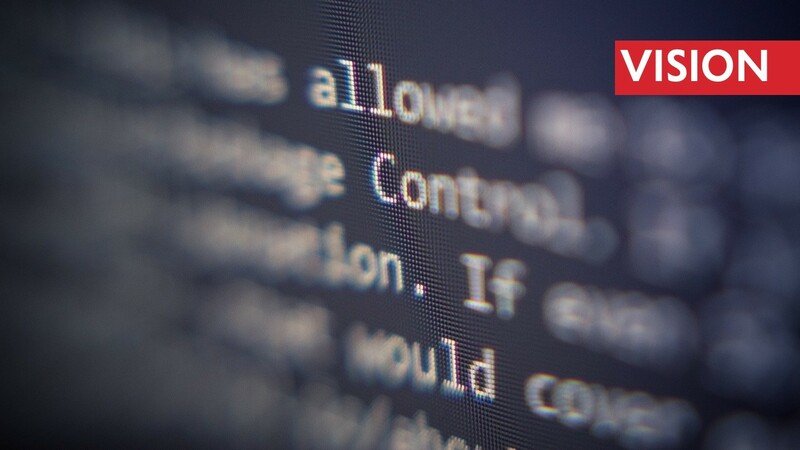 There are two main areas of consideration – their experience with the web, and factors associated with ageing such as reduced vision and dexterity. Before we get started it is important to remember not to tar everyone over 65 with the same brush. There is a large degree of variety in comfort levels with technology among the over 65s. Although all of the people in this age group may be considered digital immigrants, some have embraced online technology with relish, while others still view it as something a little foreign and confusing. The important thing to consider here is to ensure we design for those who may find the online world a little imitating or foreign, while not being condescending to those who have taken to it like a fish to water. 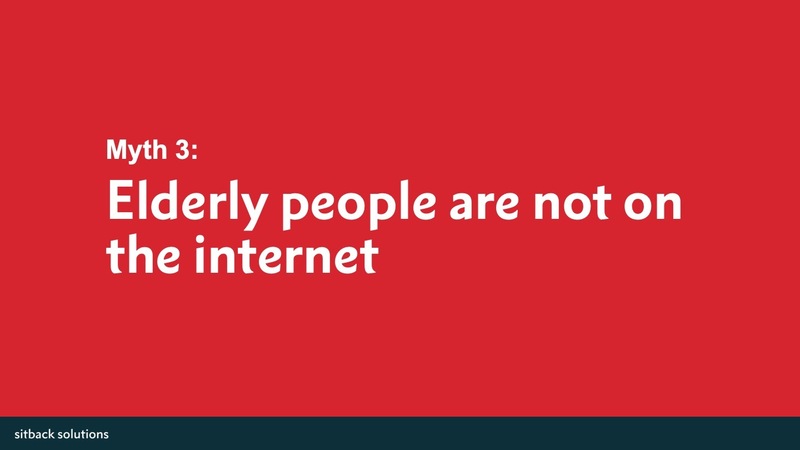 People over 65 have learnt to use the internet (to varying degrees) at a later stage of life - which means their schemas or mental models for websites and apps are not as well developed as people who first interact with these at an early age. 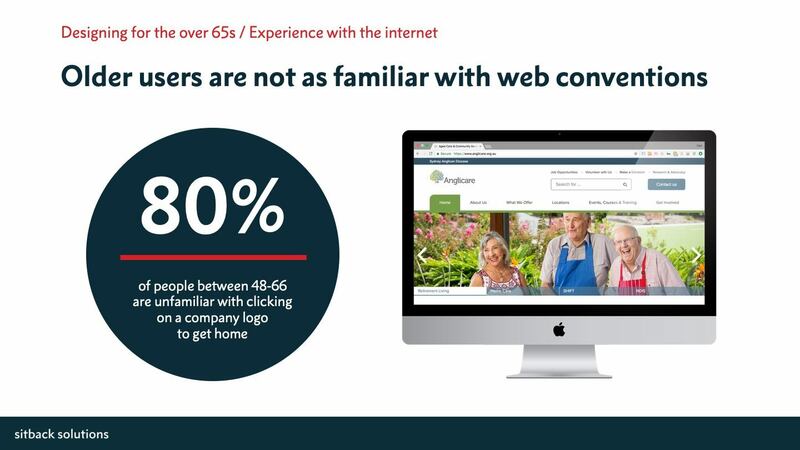 80% of people between 48-66 are unfamiliar with clicking on a company logo to get home. For example, a study conducted by Blink, an American UX Design Agency, indicates that 80% of participants aged between 48 and 66 years old are unfamiliar with the practice of clicking on the company logo as a way to return to the homepage. This is something we have encountered across user research projects and is easily addressed by including a clear ‘home’ button on your website. Clear labelling, intuitive design and affordances are all key here. And the good news is, these are elements that will make your site more intuitive for everyone. Another impact of having fewer concrete frameworks for online interaction is that this group require more sign-posting to know where to find things. Consistency of design and clear calls to action are important to provide this. This need is galvanised by this generations tendency for cautious clicking learnt from years of interacting with unforgiving design, e.g. cameras in the 1980s. In our work with Anglicare this was demonstrated by the feedback relating to virtual tours. The tour itself was well received but many users reported that they did not know the floor plans were contained within and would have been unable to find them as there was no clear indication they were there. They were unlikely to click on something if they did not know what to expect. “Label it as ‘virtual tour with floorplan’"
As you can see from their quotes, they were quite articulate is requesting clearer sign posting. 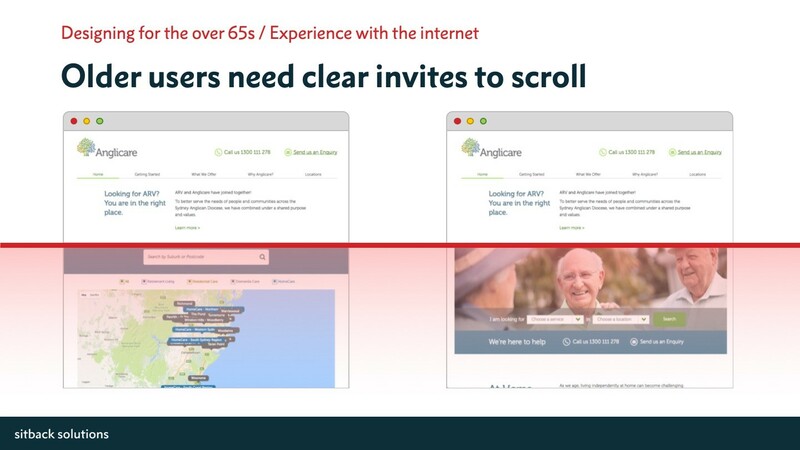 Our research at Anglicare demonstrated that older users tend not to scroll unless there is a clear affordance to so. In the screenshots presented here, the red line indicates the fold on a laptop. As you can see, there was no clear indicator that more content can be found further down the screen. As a result, participants did not think to scroll. When this group do scroll it can be a cumbersome experience as they tend to interact with the scrolling bar on the righthand side of the screen. Some participants didn’t really know how to scroll effectively. Some were clicking on sections of the side bar. Others opted to use the keyboard arrows. We are, without doubt, social beings. The fact that we look to the actions and experiences of others to inform our own is important to us at all ages. It appears it may be even more important to this generation or age group who have spent decades cultivating networks of trusted advisors to inform their decisions. Knowing that real people in a similar situation to them vouch for a service or can explain it is important. We saw ample evidence for this in our research for Anglicare. When we ran user testing with this group, participants commented with concern on images that looked staged or fake. They were also highly engaged with video testimonials developed by Anglicare to describe the experience of their service. As one participant commented “it's taking into account that people have lived their life... this needs to be considered in order to bring the support... it’s a value to me ...”. What we have discussed so far are important considerations for communicating with the current over 65 cohort that will most likely decline in importance as younger generations reach their golden years. After all, they will have grown up with technology and a different style of education - one that encourages exploration rather than following instructions. But there are some things that apply to us all as we get older that change how we behave over time, including declines in visual acuity, dexterity and memory. The good news is, like the previous section, designing for these considerations benefits the experience for all. This is not a pleasant thought but from the age of 40 the lens of the eye begins to harden, causing a condition called “Presbyopia”. This is a normal part of ageing that makes it increasingly difficult to read text that is small and close. That’s not to mention conditions such as reduced field of vision, Glaucoma and Macular Degeneration. Colour vision also declines with age, and we become worse at distinguishing between similar colors. In particular, shades of blue appear to be faded or desaturated. In addition, due to varying factors, there is a yellowing of the eye lens, which alters the colours and makes us slightly colour blind. So, what can we do to help people with reduced visual acuity? Avoid font sizes smaller than 16 pixels depending, of course, on factors such as device type, and viewing distance. Let people adjust text size themselves. Don’t rely on similar colours for meaning such as blues and purples or greens and yellows. Pay particular attention to contrast ratios with text and icons. Where possible, avoid blue for important interface elements. Consider impairments that do not require a screen reader. There is technology that enables you to simulate the experience of what your site looks like for various visual impairments. Our motor skills also decline with age, which makes it harder to use computers in various ways. Most elderly users suffer from digit agility difficulties such as arthritis, tremors, and Parkinson’s Disease, that hinder delicate movement and generally make motion slow and inconsistent. In the general population, a mouse is more accurate than a finger. But testing has shown older people perform better using touch interfaces and that finger tapping declines later than some other motor skills. This can help explain why tablets have been so popular with this group. Reducing the distance between interface elements that are likely to be used in sequence (such as form fields), but make sure they’re at least 2 millimeters apart. 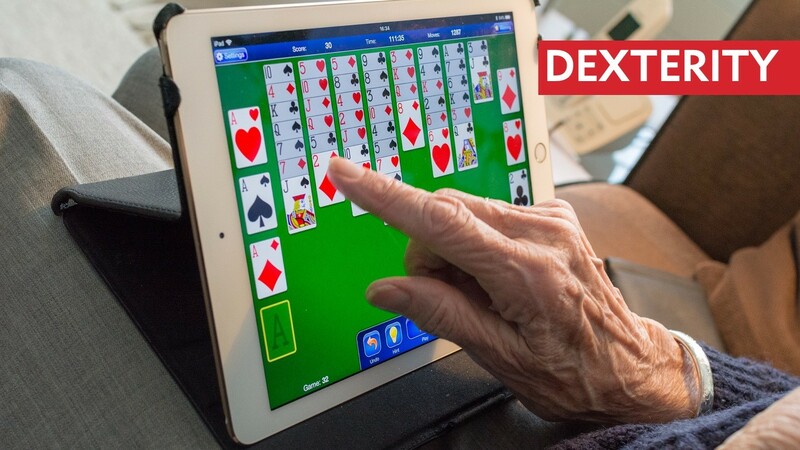 Ensure buttons on touch interfaces are large enough for older people to tap. Buttons on touch interfaces should be at least 9.6 millimeters diagonally (for example, 44 × 44 pixels on an iPad) for ages up to 70, and larger for older people. Consider navigation patterns – are they easy to click? Do not use the hamburger without a label. Avoid the double click since this can be very difficult for people with reduced dexterity. The last consideration for today is memory. 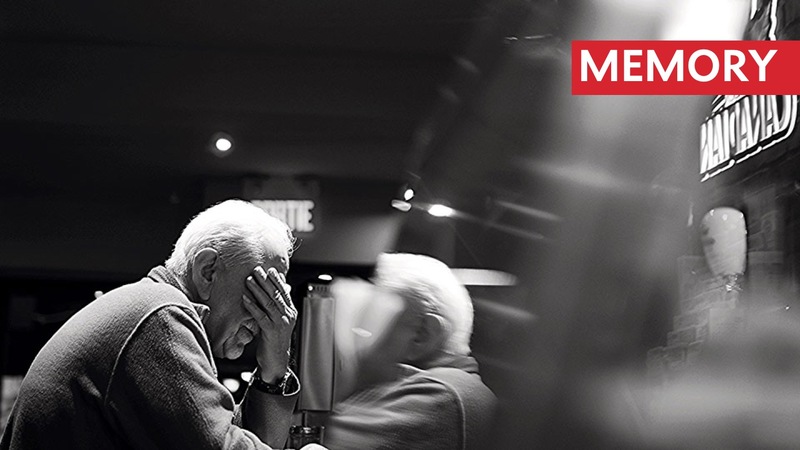 There are different kinds of memory, and they’re affected differently by the ageing process. For example, procedural memory (that is, remembering how to do things) is generally unaffected. People of all ages are able to learn new skills and reproduce them over time. But other types of memory suffer as we age. Short-term memory and episodic memory are particularly vulnerable. In addition, people often have difficulty manipulating the contents of their working memory. This means that they may have trouble understanding how to combine complex new concepts in a product or interface. So, how we can accommodate declines in memory? The screen should be designed in a manner that assists quick scanning of the core content and swift navigation to the relevant location. In testing, participants expressed positive attitudes to pages that were “neat”, “not dominated by lots of information” and “look spacious”. Introduce information sequentially - Introduce product features gradually over time to prevent cognitive overload. Avoid splitting tasks across multiple screens if they require memory of previous actions. During longer tasks, give clear feedback on progress and reminders of goals. Use double coding, e.g. when we use labels aside icons (a home icon with the word “Home” attached to it, or an envelope beside send email). Provide memory cues, e.g. change the colour of links that have been clicked on. If there is no colour distinction between links that a user has visited and is yet to visit, they may lose track of where they have navigated to. As we have learnt throughout this journey, not only are over 65’s actively online and making purchasing decisions, but with some relatively minor design considerations, we have a great opportunity to make our online experiences more engaging and pleasurable for a large proportion of our customers. As mentioned at the beginning of this post, we’ve been so fascinated by the misconceptions around the elderly population and how they interact online that we have decided to conduct an even deeper dive into the topic. Our User Experience Design Team have kicked off an investigative research project looking at elderly perceptions of e-commerce and purchasing behaviours online, as well as their perceptions and use of personal data. Register your interest and get exclusive early access to the report and all key findings.